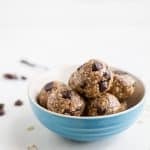 These Simple No Bake Chocolate Peanut Butter Energy Balls make the perfect snack, breakfast, or even dessert! They’re packed with protein and taste like a Peanut Butter Cookie! Add rolled oats, ground flax seed, chia seeds, cinnamon, dried dates, peanut butter, vanilla extract, and vanilla protein powder to food processor. Slowly add water to the food process and blend until the mixture sticks together. You may need to add more or less water depending on your energy ball dough. Add mixture to a large bowl, using your hands mix in chocolate chip. Serve immediately or store in air tight container in refrigerator.